When we say – Sirplay is the gaming solutions expert providing the best – we mean we also do it for your Betting shops. 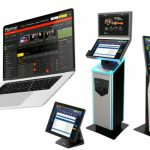 Our retail betting terminals are designed to be All-in-One Solutions with a printer, a POS, an Android System and our Betting Software Ready-to-Go. They can fit in your palm, which means they are perfect also for the smallest betting shops. Built-in thermal printer, with 10m autonomy!